Studies show that approximately 60% of crowdfunding projects never get funded. Givebuy's new tool aims to lower that statistic by generating money from over 700 partnered retailers for projects whenever supporters shop online. This is an example of what a page from Givebuy will look like. It includes a short bio, video & photo, generated totals, top 50 store links and the option of using a browser add-on. On average, a single Givebuy user will generate between $10 to $15 per month for a project they care about. Running a successful crowdfunding campaign can be an overwhelming task to say the least. According to Kickstarter's own stats, only 44% of campaigns meet their funding goal. This means roughly 60% of projects on Kickstarter will never experience the joy of being funded. One company out of Austin, Texas is trying to change that with an innovative tool that helps crowdfunding projects make more money through their supporter's online purchases. "So many crowdfunding campaigns fall short of their financial goal." said Andrew Parker, Givebuy's founder. "We offer a creative and modern approach to help a lot of people get funded. Over 10,000 people use Givebuy everyday to support something that they care about." Givebuy has a application form where users submit their crowdfunding project. If a project is approved then a customized Givebuy page like this one will be built. All sales made through this page are tracked by Givebuy and the generated total is paid to projects each month. The retailers pay for it all so it doesn't cost supporters a penny more than they would normally spend. Givebuy was initially developed in 2014 as a way to help non-profits raise money through their supporter's online purchases. 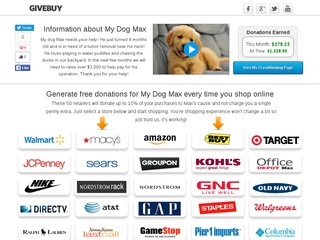 Today, Givebuy is partnered with over 700 retailers and has generated thousands of dollars for several worthy causes. The company was recently voted a Top 5 Community Minded Company by the Austin Youth Chamber and has launched several campaigns that bring awareness to current world issues. Givebuy is now expanding to help more projects get funded on sites like Kickstarter, GoFundMe and Indiegogo. "On average, a single Givebuy user will generate between $10 to $15 per month for a project they care about." said Andrew. "Whether a project is trying to raise $100,000 to bring a new tech product to market or $250 for a pet's surgery, Givebuy is a great tool to help projects reach their funding goals." Why? Well, for starters it doesn't cost anything. Retailers actually pay Givebuy a separate commission for sales. This enables Givebuy to be a zero-cost platform and is also why projects receive 100% of their generated total. Additionally, Givebuy has developed the option of using a browser add-on that kicks in at over 700 partnered stores. It's a hands off approach so supporters won't need to visit a their project's Givebuy site whenever they shop online. The add-on is available for Chrome, Safari & Firefox. This is an example of what your customized page from Givebuy will look likeJust click on a store and start shopping. Any purchase made generates money for your crowdfunding campaign. The retailers pay for it all so your supporters don't pay a penny extra.